Bookings open at the beginning of the school term, prior to the holiday program (eg. October holiday bookings open at the beginning of Term 3). Bookings close two weeks before the program begins, so that we can receive all medical forms and send out transportation information to you prior to the program. Wollangarra’s introductory program, “Meeting the Mountains”, offers young people from 14 –17 years the chance to discover the heart of Victoria’s high country in small, well organised and supervised hiking groups. The major aim of these expeditions is to encourage an awareness of our environment. “Meeting the Mountains” expeditions are a five-day course with a two night, three-day hike and time to also experience the pioneer lifestyle of Wollangarra. Go hiking in small groups with two Wollangarra hike staff members. 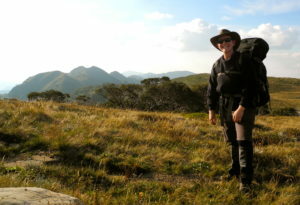 The hikes take place, in either the Alpine National Park or locally in the mountains surrounding Wollangarra. The hike is designed to be an enjoyable experience for the young people, as we are looking to establish a positive connection between them and the mountains. The hikers return on the Thursday evening to a hot shower and a lamb roast waiting for them. After which we all sit around open living room fire and swap stories of the week. Friday is clean up and leave day. Everyone finishes the Wollangarra Stage One by walking without bags out the telephone track, from Wollangarra to Cheynes Bridge.